Mega Sale! Save 29% on the Ceramic Knife Set with Block- 5 Pc Cutlery Ceramic Knives Set By Good Cooking (Black Handles) by Good Cooking at Baking Love. MPN: GCO_CER-BLK. Hurry! Limited time offer. Offer valid only while supplies last. 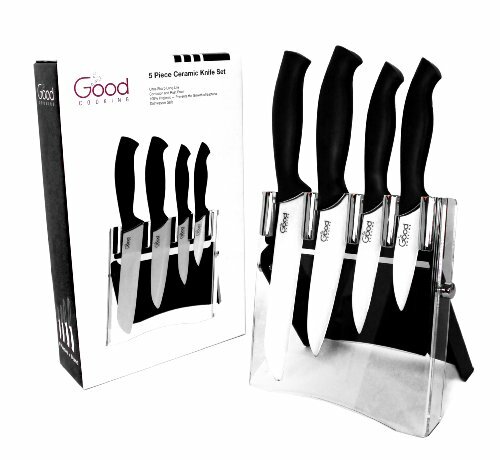 Ceramic Knife Set with Block- 5 Piece Cutlery Set by Good Cooking (Black Handles)- Our ceramic knives are the better alternative to stainless steel. 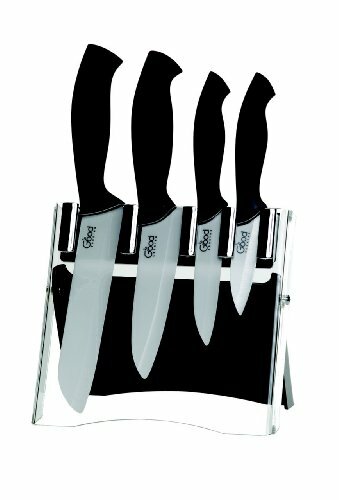 Ceramic Knife Set with Block- 5 Piece Cutlery Set by Good Cooking (Black Handles)- Our ceramic knives are the better alternative to stainless steel. Featuring soft touch handles, these knives are perfectly balanced and a pleasure to use. Unlike stainless steel, these won't rust or corrode. The ultra sharp blade can go months or years without sharpening and is dishwasher safe. Includes paring, fruit, chef's, and santoku knives along with stylish acrylic block.